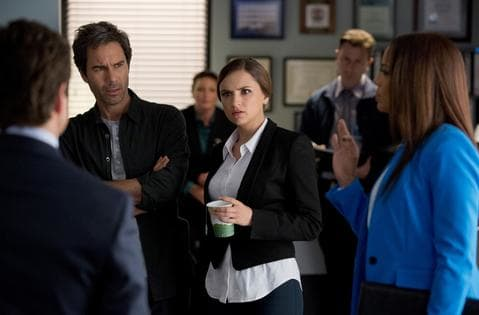 The whole concept of perception and what the brain allows us to see or not see really made "Blindness" an engrossing episode of Perception Season 2, if not a memorable one. I think it's great that the show takes very real brain-centric topics (whether it's focusing on a woman who thinks there are aliens or a bad guy who miraculously becomes a good guy). But to do so, it often relies on the viewers complete acceptance of such, especially because Dr. Pierce is the smart science professor who knows his stuff. Except here, we were able to see examples of what Pierce (and ultimately, the killer) was trying to show. Even though I knew Pierce and Kate Moretti were going to pull a switcheroo on the disbeliever Donnie, I still almost didn't notice that there were two separate girls for the situation. Additionally, watching the basketball game, I kept wondering when the murder was going to take place. So, when Pierce said to rewind the video, I was a bit confused. Yet, the stabbing did already take place, and I completely missed it. Guess my eye really was on the ball rather than the alligator sticking it to the ref. Now, I found the prime suspect's story about not witnessing the cop beating a little shaky, but then again, why couldn't his version of events be the truth? In a lot of ways, the episode felt interactive and allowed me to think and learn along with Pierce. What's more, the hallucination of the mascot pushed Pierce to think rather than spell out the answer. It even made me appreciate when Pierce told Natalie, "Why didn't I think of that?," to which she responded, "You did." It's easy to look past Natalie as a hallucination because we see her every episode, but she too is just another form of us watching his brain at work, while the alligator gets to be the little more crazy side of Pierce putting it all together. Silly? Maybe, but these are hallucinations after all and they are all on what's related to Pierce's thinking at the time. I had a feeling Pierce was going to get locked in the police office too. Saying people are going to die unless you speak to someone probably isn't going to help your case. Guess Pierce is lucky Moretti was there to save the day. I'm still not convinced that a Pierce and Moretti romantic relationship would be beneficial to the series... yet. I like that Pierce is blind to her affections (and I was glad they brought back up she was a former student), but I'm not sure if jumping into the love doctor situation should happen still. I'm more partial to the working relationship right now, but I guess we'll see what's in store for this duo. That said, I like that Donnie is still playing to get in Moretti's good graces, or wherever he wants to get. He's definitely a good addition to the show and adds another layer to everything going on, while also connecting them to the legal side of all the police and detective work. And while this triangle takes up most of the character screen time, I was pleased that Lewicki got a chance to do a little more. Not only did Pierce finally give up the reigns to let him teach class, but it turns out Lewicki isn't so bad after all. He can do more than grocery shop for fruit or answer text messages. Certainly a fascinating topic for the hour, one made even more relevant with using phones in the car. Maybe a little PSA, but really it was just another layer of illustrating how the brain works and sometimes allows us to completely miss something right in front of us. And with an episode like this one, hopefully, Perception isn't the thing you're missing out on.